As you may have noticed, DC Comics recently radical refurbished their superhero books. Among a legion of sweeping changes comes the announcement that "the Crises" — a series of keystone stories with names like Crisis on Infinite Earths and Final Crisis — were poofed out of existence when the DC Universe began anew. And while many a great yarn happened during the Crises, a bunch of goofy plots went down too. Here are 10 malodorous Crisis moments we won't miss. For those in crisis over Crisis, let me clarify. The topic of Crisis was much discussed among the editors and talent working on The New 52. With so many characters and histories restarting, major events like Crisis are harder to place when they work for some and not for others. (that was one of the problems coming out of the original Crisis). While we are starting aprx five years into our heroes' lives, we are focused on the characters present and future, and past histories will be revealed as the stories dictate. Yes, there have been "crisis" in our characters lives, but they aren't exactly the Crisis you read before, they can't be. Long story short, there's a new Crisis on the block, which I will henceforth refer to as "Mystery Crisis." But let's take a hot second to eulogize the past Crises. So yes, while the Crises have produced some jazzy superhero moments — see the death of Barry Allen from Crisis on Infinite Earths, Batman "dying" to kill an insane space god — there have been oodles of silly twists. Join as we dance on the graves of some of the most ridiculously convoluted Crisis plots. Superboy-Prime — who hails from an Earth where he's the only superhuman — has been a key player in almost every single Crisis story. The character began his existence as a righteous dude, but slowly went bonkers when he became trapped outside the walls of reality. 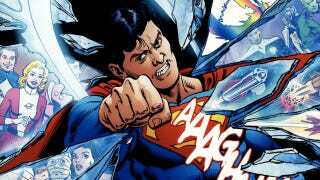 In 2006's Infinite Crisis, Superboy-Prime punched through these crystal spacetime walls to return to Earth. Incredibly, his multiverse-shattering "retcon punch" became the reason for any and all contradictory DC stories. Who needs handwavium when you have Superman's right hook? After Infinite Crisis wrapped up, DC launched 52, a weekly series that showcased the events of the DC Universe over the course of a year. Fans and critics liked it, even though the grueling pace drove everyone involved insane. DC attempted to capture lightning in a bottle again with 2007's Countdown to Final Crisis, a much crappier 52-week series designed to lead into, yup, Final Crisis. But due to an editorial snafu, Countdown to Final Crisis began inadvertently publishing the story Final Crisis was supposed to tell. Nothing made a lick of sense, so everyone chose to forget Countdown to Final Crisis ever existed. In Infinite Crisis, Superboy-Prime's "Anakin Skywalker Kills The Younglings" moment is when he accidentally knocks the block off of Pantha, a D-list feline hero. Sadly, this is probably the only reason anybody remembers who Pantha is. Sue Dibny was the plucky, no-nonsense wife of Ralph Dibny, the Elongated Man. For a long while, Sue and Ralph were a goofy couple who were mostly used for comic relief. But in 2004's Identity Crisis, Sue was brutally murdered in the first issue. Readers next discovered in the second issue that Sue had been secretly raped by Dr. Light, a bumbling doofus supervillain. If you're confused as to why this was a big deal, replace the names "Sue Dibny" with "Mary Tyler Moore" and "Dr. Light" with "Abbott and Costello." Now you know why absolutely nobody liked Identity Crisis. At the end of 2008's Final Crisis: Legion of 3 Worlds, Superboy-Prime (again!) is caught in a reality paradox and exiled powerless to his homeworld, Earth-Prime. But his parents and girlfriend have read of his supervillainy in "fictional" DC Comics, and they're terrified of him! Dejected and psychotic, Superboy-Prime moves to his parent's basement, where he spends his existence sparring with comic fans over the internet. After 1994's Zero Hour: Crisis In Time, Guy Gardner — a charmingly assholish Green Lantern with Moe Howard's haircut — was transformed into Warrior, perhaps one of the most generically 1990s superheroes around. He had tattoos! That made him edgy, right? One of the most disappointing comics I've ever bought was 2007's Countdown: Arena, a tie-in with Countdown to Final Crisis that promised deathmatches between parallel universe versions of DC's superheroes. Unfortunately, this surefire fan-bait comic was seemingly hustled out the gate and proved to be a forgettable snoozer. During Zero Hour, Hawkman's tortuous origin was amended such that DC combined the previous incarnations of the hero into a single person. This only confused readers more, and this reboot was tossed in the trashbin when Superboy punched the wall of reality. In the 2007 Countdown to Final Crisis spin-off Salvation Run, absurdist supervillains Monsieur Mallah and The Brain are pointlessly killed by an angry Gorilla Grodd. This duo was a super-intelligent French gorilla and a disembodied brain in love! That's more valuable property than Batman, dammit! Thankfully, this strange romance has been resurrected in the new DC Universe. Yeah, I already mentioned this scene. But this panel! Comedy gold. Okay I'll admit it. I'll miss this.